Immersion participants will build and characterize a mode-locked erbium fiber laser. Basic laser physics (gain, loss, cavity dispersion) determines the performance and properties of the laser output. The nonlinear polarization rotation passive mode-locking method will be explored. It uses the nonlinear properties of the cavity fiber, which affect polarization rotation, to favor high-intensity pulses. We will carefully align a polarizer and a series of waveplates in a free-space segment of the cavity (see figure below) to optimize conditions for pulses. Output pulses from such a laser can be on the order of 100 fs and are strongly influenced by the cavity dispersion properties. The Fourier transform of a train of pulses is a relatively broad spectrum of individual frequencies separated by the cavity pulse repetition rate. When stabilized and broadened, this comb of frequencies acts like millions of stable lasers and can be used for applications such as frequency metrology. Participants will make the first steps to make the mode-locked erbium fiber laser in this Immersion into a frequency comb, such as measurement of the pulse carrier-envelope offset frequency. 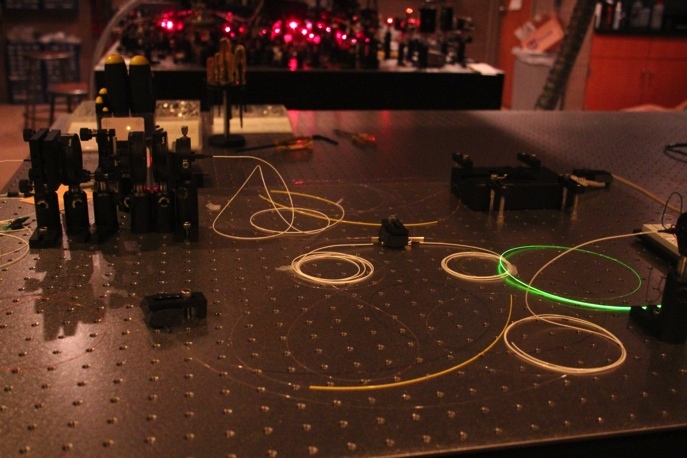 Participants will use an auto-correlation apparatus that is based on the nonlinear response of a silicon photodetector at the lasing wavelength of 1.5 micrometers to characterize the temporal profile of output pulses. Participants will also use a parallel-grating dispersion compensation device to characterize and control pulse chirp.